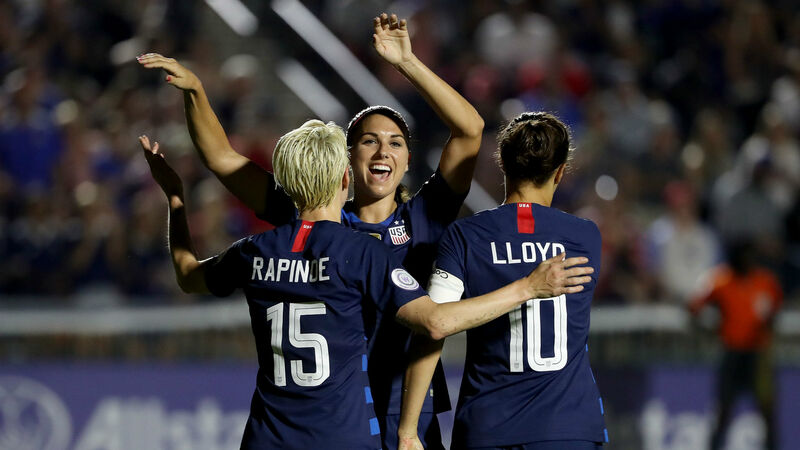 CARY, N.C. — The U.S. Women’s National Team followed up a dominant 6-0 victory over Mexico in the opening match of the 2018 CONCACAF Women’s Championship with an even more impressive match against Panama, coming one step closer to punching a ticket to the 2019 FIFA World Cup in France. The 5-0 win came behind a strong night from Carli Lloyd, who led the U.S. with a hat trick. Coach Jill Ellis made significant changes to the starting lineup as she started only two of the same 11 players that faced Mexico on Thursday with Abby Dahlkemper and Julie Ertz keeping their positions as repeat starters. Since the U.S. will play five games in less than two weeks, Ellis is keeping the bigger picture in mind and wanted to give other players a chance to play. Similar to the Americans’ first game of the tournament, they wasted little time getting on the board with a big play from Sam Mewis, who used her height to her advantage as she found the back of the net by heading the ball off the corner. From there, in a span of just 10 minutes, the USWNT put up three more points (two from Lloyd and one from Christen Press), all of which were unanswered by Panama in the first half as the U.S. took the lead 4-0 going into the break. Out of the half, Lloyd continued to shine as she added another goal for the U.S. (her 105th goal for the USWNT) in a much slower second half. Mallory Pugh added her first of the tournament in the 73rd minute to close out the victory and give the U.S. its 11th goal of the tournament. The defense did its job — allowing only four shot attempts, compared to the Americans’ 35. With Sunday’s victory, the U.S. hasn’t conceded a single goal in any of their last eight World Cup qualifying games dating back to 2011, winning all eight games while scoring fewer than three goals just once. The U.S., top ranked in the world, has one more game in Cary against Trinidad and Tobago on Wednesday before heading to Texas for the semifinals as the team edges closer to securing its spot for the 2019 FIFA World Cup championship.